Any time your baby is supervised and positioned on the stomach for play, that is considered tummy time! The American Academy of Pediatrics formally recommends that parents provide babies with supervised playtime on the stomach to promote growth and development and prevent flat spots from forming on the head. My research reveals that approximately 50% of parents report that their infants do not tolerate being positioned on the stomach for play! Parents consistently tell me how their infants fuss and cry with every attempt at tummy time. I can hear the frustration in their voices. Yet there is good news! 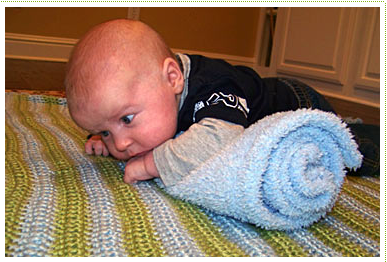 I know that with time and a few simple tummy time tips, any infant can learn to tolerate this position. There is a solution to the problem, because I know how to introduce tummy time without making a parents’ and baby’s life miserable. This page provides useful tips and stimulating activities to introduce tummy time and to increase your infant’s tolerance tummy time. An important reminder, once your baby starts participating in tummy time, always remember, you should absolutely never leave his side! In this world of distractions, it is likely that a phone will ring, or someone may call you in another room, but NEVER leave your baby unattended while in the tummy time position! There is always the risk that baby could fall asleep, and being on the stomach puts him at an increased risk of SIDS. So, never leave your baby’s side and give him your undivided attention during every second of tummy time! With time and a few simple techniques, any infant can learn to tolerate tummy time. Here are some tips on how to introduce tummy time and increase an infant’s tolerance without making parents’ and baby’s life miserable. Start Early. Believe it or not, you can begin exposing your baby to tummy time while you both are still in the hospital. The earlier you start, the more likely that your infant will accept the stomach as a natural position. Before the umbilical cord has fallen off and before baby has good head control, you can position your newborn on your stomach or chest while you lie in a reclined position on a chair, bed, or the floor. 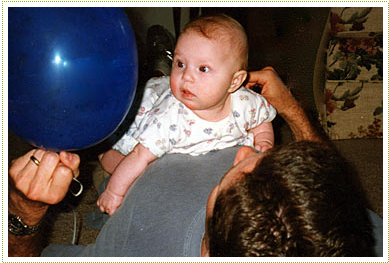 This is the perfect opportunity to socialize with baby by encouraging eye contact. You can even rock your body from side to side to incorporate some movement while baby is positioned like this. 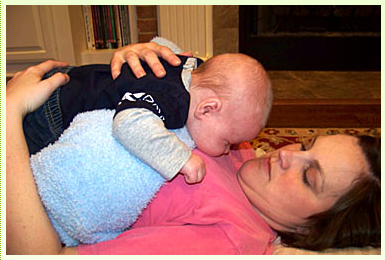 This can be a great way to calm your infant if he doesn’t seem to be too crazy about the position. If your baby cries or rests his face on the surface, this likely means he is tired, so be sure to end tummy time at that point. Start Gradually. Your baby may only tolerate 15 seconds of tummy time on the first attempt. That is fine! You can add 15 to 30 seconds at a time, moving toward 3 to 5 minutes per session. The goal is to eventually work up to 40 to 60 minutes per day, but this does not have to happen all at once. Remember to always stop if your infant begins to cry in protest. Take a break, and try again later! Bolster Time. One way to make tummy time feel less like work is to make a small bolster by rolling up a thin towel or blanket and place this under baby’s chest. Position baby’s arms over the roll with his hands stretching out in front of the roll. If baby’s chin drops, it should still be positioned slightly in front of the roll, and so that his mouth and nose still get plenty of air. There is also a commercially available product, called a Boppy nursing pillow that does a nice job providing support during tummy time. Lap Time. Position baby across your lap long ways while providing head support. Remember to keep baby’s head aligned with his body and if baby falls asleep in that position, immediately transfer him to the bed (lying on his back). Entertain Baby. If your baby dislikes being on her stomach, remember this: entertain, entertain, entertain! Do whatever it takes to get your baby’s mind off of her position. 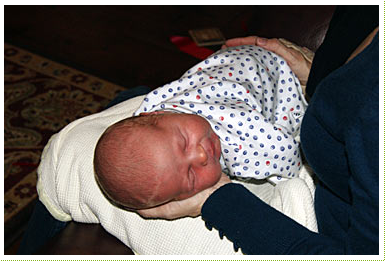 You can even position baby on your stomach or chest while you are in a reclined position. Be sure to make eye contact, talk, and sing to your infant, as this will attract her interest. You can play music, sing, shake toys, and clap your hands, or place a mirror in front of her, keeping baby occupied until you gradually stretch the seconds into minutes. Face to Face Time. Lie down on the floor facing your baby during tummy time. Stay on his eye level and talk to him or read to him. Remember, your voice and expressions should be animated! Have a Schedule. Having a schedule makes is easier to remember tummy time, and your baby will likely come to anticipate the routine. Incorporate tummy time into the activities you’re regularly do with your baby, such as drying off with a towel after bath time, changing diapers, or applying lotion. Just remember to never leave your baby’s side during tummy time!